April 5th the band travled to College of the Ozarks to play before Keith Reither, the high school band director at Lebanon. The band performed their two concert pieces and then the judge worked with the band on areas to improve for contest. They were given a rating of 2 out of 5. The band then listened to the high school bands from School of the Ozarks and New Covenant Academy. Afterwards the band had pizza for lunch and then visited the Rex Plex to enjoy the fresh air before heading home! 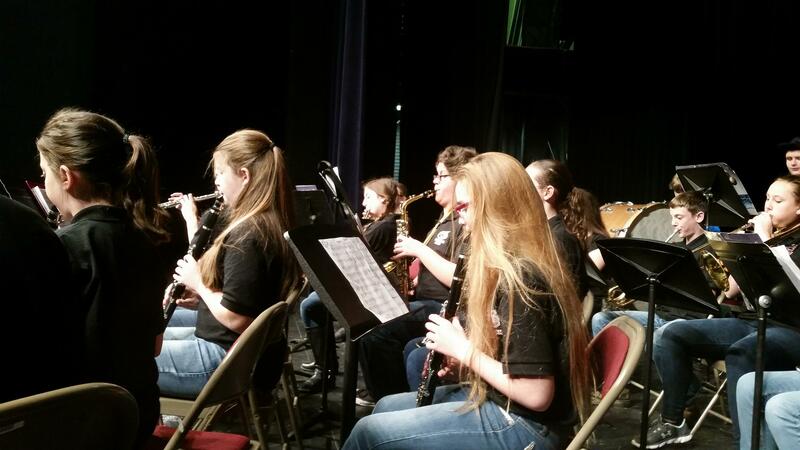 Earlier this semester Middle School band students traveled to Evangel University to compete against fellow students. We had 8 solos and 1 clarinet trio perform in front of judges and each entry received a 1 rating, the highest rating received from a judge. This year the band council was formed. The band council helped and planned a Valentine’s Day Dance and Karaoke Night to fundraise for the program. It was a great success and many students came out for the fun! 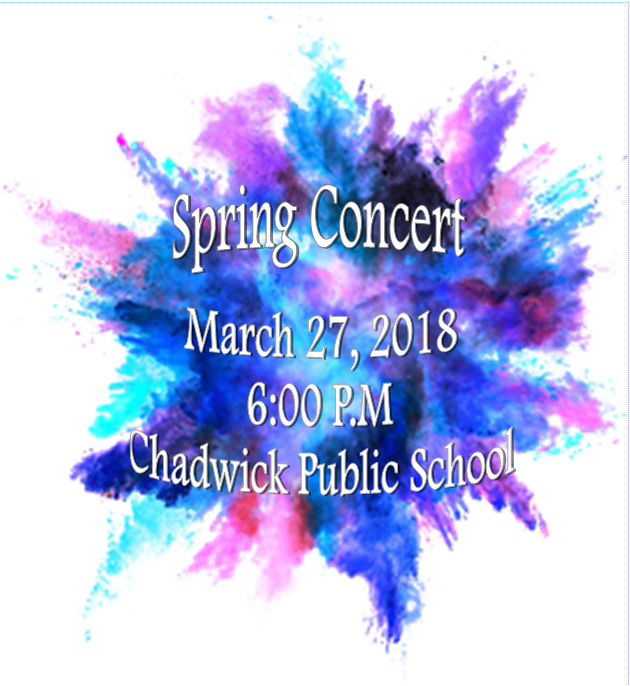 This year’s spring concert was a colorful blast of music. Students sang, rang, danced, and played boomwhackers. The band presented three pieces, two of which go to contest. Elementary student dressed up in fun colors and the 3rd grade class wowed everyone with their recorders and colorful scarves. This year the music appreciation class attended the Young People’s Concert in Branson Missouri performed by the Springfield Symphony Orchestra. In class they learned about all of the different instruments and the instrument families. They took their knowledge a step further and got to see what they learned live and in action! This year two students were sent to the SCMMEA Junior High Honor Band. They both are at the top of their class in the band and have shown exceptional musicianship. Both attended an all day festival full of rehearsal with two well known band directors. One of the directors is even the composers of one of our contest pieces! The girls had a great day learning and having fun playing in a band of more than 100 students! The final concert was a great success. The girls also competed for chair placement. Katie Sallee won 7th chair and also performed a solo in one of the pieces, and Natalie Parker won 4th chair. Christmas for the Chadwick Music program was a busy season! The music appreciation class visited two local nursing homes in Sparta to sing and ring to residence and spread Christmas Cheer. The rang chimes and sang Christmas carols and had a great day serving others! The Music Department presented a great Christmas Program including presentation of a Charlie Brown Christmas! Children sang, the band played and everyone enjoyed the play! Our pep band played at the opening home basketball game and enjoyed exciting the crowd as we cheered on our Chadwick Cardinals! The band also had a big Christmas party and a game of White Elephant Christmas. Students all brought small gifts and had fun picking and stealing gifts from each other and playing games! 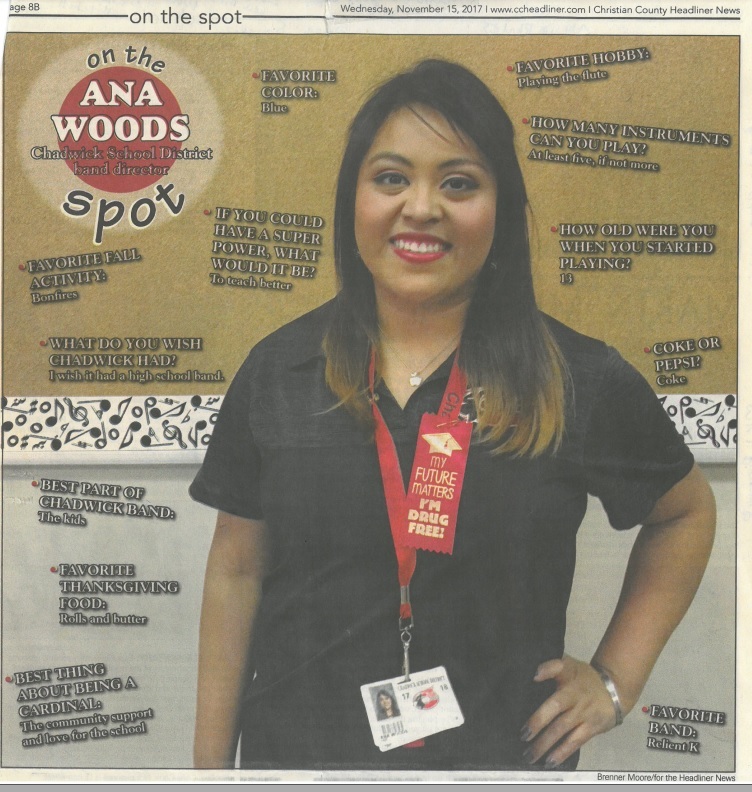 For fundraising Ms. Woods painted faces for Christmas. 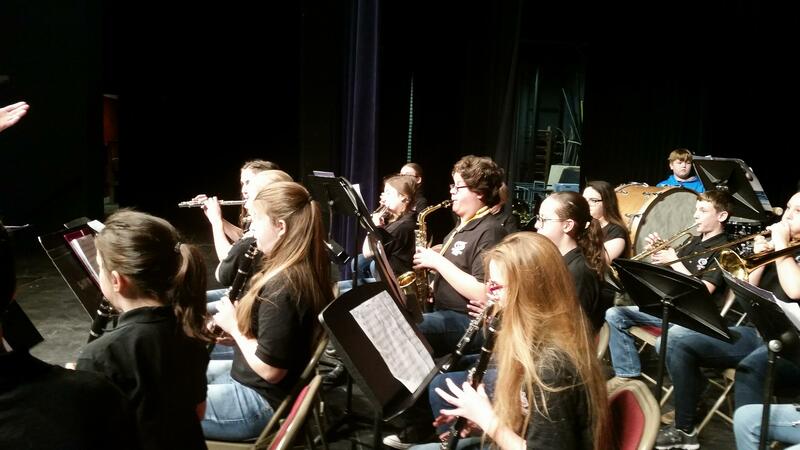 The top band students attended the Crusader Music Festival on March 23rd at Evangel University. There they competed along with Hartville band students in a solo and ensemble competition. All solos and ensembles received a division 1 rating, the highest rating given! Thanks to the the Christian County Headliner for featuring the band program!!! We were so excited to have a few students interviewed and share the success of the past year and a half with the community! Had the kids sign our copy!!! The Band Goes to Festival! For the first time in the history of the program, the band entered and attended a music festival. We attended the Fairgrove Junior High Music Festival in Fairgrove Missouri on April 8th, 2017. The band prepared two contrasting pieces to be performed in front of judges. Ten students also individually prepared solos and two small ensembles. The morning started out early as we met for inspection and hopped on the bus. The band arrived early at Fairgrove High school and the woodwinds prepared to perform. The flute solos, flute trio, and clarinet solos went very well! The judge took a few minutes to talk with each performer about breathing, articulation and phrasing. She said everyone had a great tone quality and a full rich sound! The band met again and lined up to be walked to the warm up room. They had practiced their walking and looking sharp. We wanted to leave a good impression with the other schools. They entered the warm up room and had a good time rehearsing bits and pieces and warming up. Finally the room monitor led us to the gym. Of course, Ms. Woods left her conducting baton in the warm-up room so one of the students ran back to get it before we entered the room. The students walked in looking really sharp and professional. One of the judges commented that we looked really put together and prepared. We played our two pieces and they were performed brilliantly. Every student was focused and engaged as we made beautiful music together! After the performance the two judges walked up to the band and said they did an amazing job. The first judge talked about articulation and dynamics and the second judge followed him. They both said we looked really sharp and they LOVED the matching shirts. Then, my favorite moment, the first judge asked “Raise your hand if this is your first competition” and we ALL raised our hands including me the director! He was completely shocked. I told him the program was only 4 years old. He asked if I had been there all four years and I told him that this was not only my first year at Chadwick but also my first year teaching. Both judges said they NEVER would have guessed that this was everyone’s first time competing. He said “I take back everything I just told you. You all are fabulous!” The other judge agreed! They both said that we have done an amazing job to keep working hard! We waited for about an hour in the cafeteria and the brass began warming up for their solos and ensembles. Suddenly there was an announcement that new scores had been posted. We ran to look at the woodwinds and there, on the wall, were Superior 1 ratings for our two flute solos, one flute trio, and two clarinet solos. We were all so excited jumping up and down celebrating! We continued down the line reading the other scores. There, on the wall, was the scores for the band and it said Superior 1 rating!!! It was such a complete shock and everyone started screaming and jumping up and down as we celebrated. Then we realized the brass were still in the warm up room and had no idea about our scores. We all went to the warm up room and had the brass quiet down because we had important news. When they found out the whole gym filled with screams and we began jumping up and down again. It was the best feeling in the world! Finally it was time for the brass to perform. Each solo and the trumpet trio was performed beautifully. The judge even asked Jaron, the tuba soloists, to shake his hand for playing so well! He said everyone had a great tone, projected well, and looked sharp. Awhile later scores were posted and once again EVERY SOLO AND ENSEMBLE received a Superior 1 rating! We were so shocked and everyone was so happy. The band ran out to the bus to put up all the music and instruments as we waited for our comment sheets back. When we came back into the cafeteria we saw one of the chaperones holding something shiny. She gave us our packet with our score sheets and a beautiful trophy that said Fairgrove Music Festival: I Rating. We were elated and began celebrating again. All of this was a total shock and we had no idea that the competition would turn out this well. Every student who performed in a solo and ensemble also recieved a blue ribbon that said ” I rating” on it! We ended the day by celebrating and relaxing at Steak and Shake. Burgers and shakes are a good reward for a successful day. I am so proud of all the band has accomplished this year! We’ve overcome so much, worked hard every day in class, practiced and prepared at home, and it has all paid off. Rebecca White on A New Banjo and a new Drum! woodsa on A New Banjo and a new Drum!